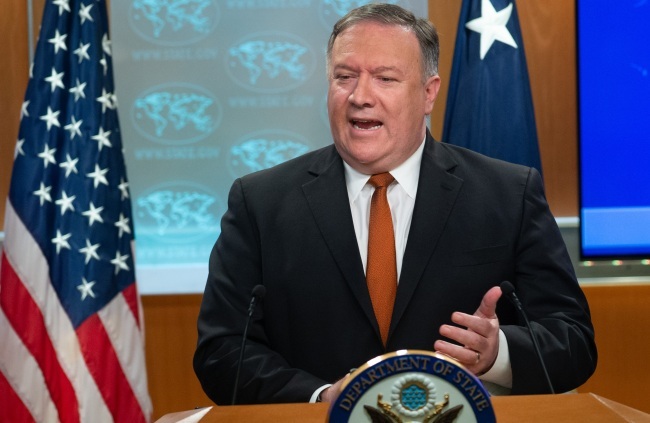 The United States remains committed to enforcing United Nations sanctions on North Korea to achieve the full dismantlement of Pyongyang‘s nuclear weapons program, US Secretary of State Mike Pompeo said Friday. North Korea is under a wide array of UN and US sanctions for its nuclear and ballistic missile programs, and Pyongyang has sought to win sanctions relief as part of a denuclearization deal with Washington. Pompeo reiterated the US stand that it will not back down from sanctions before North Korea takes credible steps toward denuclearization. North Korean leader Kim Jong-un committed to work toward the “complete denuclearization” of the Korean Peninsula after his summit with US President Donald Trump in Singapore in June. In return, Trump promised security guarantees from the US. “He said it at the summit in Singapore and we are still continuing to have many conversations with the DPRK about how to effectuate in achieving all the commitments that were made during the Singapore summit,” the secretary added, referring to the North by its official name, the Democratic People‘s Republic of Korea. Pompeo also accused Russia of undermining the UN sanctions.